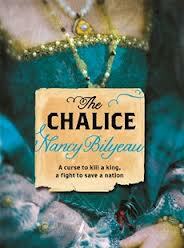 Joanna Stafford’s Tudor adventures continue in Nancy Bilyeau’s second novel, “The Chalice”, which is released on 28th February. Reeling from the dissolution of Dartford Priory and the oppression of the Catholic faith, novice nun Joanna now has to make her way in the world without being able to take her holy orders. She and some of the nuns and monks from her priory live openly in Dartford as ordinary citizens. They do charitable deeds for the inhabitants of the town but have to practice their faith in an almost secretive manner, due to the zealous persecution of Catholics in England. A chance meeting with a cousin propels Joanna back to London and she is thrust into the middle of a high-level conspiracy to restore the True Faith and remove King Henry VIII from the throne. Her beau and constant protector Geoffrey Scovill is on hand to aide Joanna as the prophetic statements made to her in her youth, by a dead Dominican nun begin to reveal, to her horror, that she has a vital role to play in the treasonous plot. Once again she has to face her persecutors head on and work with those she fears in order to secure The Chalice and fulfil her own destiny. Once again Nancy Bilyeau has delivered a book that grips you from the first word to the last. As some of my regular followers will know, I am not a huge fan of Tudor period fiction as it treads the same well-worn path. However Nancy Bilyeau turns this genre on its head with her unique, challenging and emotive character, Joanna Stafford. Her research is of the highest quality and she weaves real characters with fictional ones in a seamless manner and her books educate as well as entertain. This second instalment gives an insight into Joanna’s past that was not explored in “The Crown” and you can genuinely sympathise with her plight as she tries to follow her faith in a time when the newly formed Church of England persecuted and executed Catholics with impunity. All of the characters are deeply constructed and their personalities shine in an almost pantomime hero/villain way – which is a great thing! If you want to read the first instalment of Joanna Stafford's adventures, "The Crown" is also available to purchase from my Amazon store. Read my review of "The Crown" here, which I awarded The Golden Hammer & Anvil Shield. Great review, Stuart. I really enjoyed The Crown and am looking forward to reading this one, which I'll be doing sometime in the next few weeks. Melissa: Thank you! I am delighted to hear it. Sounds stupendous! I can't wait to read this. The novel's cover is gorgeous, well done! I've not commented here before, but I've enjoyed reading your reviews and interviews, and have awarded you the Liebster Blog Award.